This is the game that started it all, it was the first game in the highly popular untamed series of 243 ways to win video slots by Microgaming. This game is themed around a wild Wolf Pack that lives in the mountains. This is why players will notice that the reels of the game are conveniently located in the mountains with long trees and rocks in the background. The game has 5 reels on which the 243 ways to win of the game are spread across. 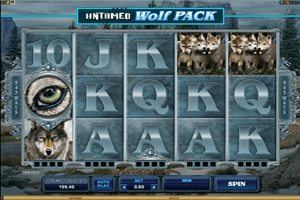 Play Untamed Wolf Pack Slot here. Of course, all of the symbols are inspired by the Wildness and the Wolf Pack as well as they include the Wolf’s eye, a howling wolf, a wolf pack, a group of dears, the mountains and the logo of the game as well as card symbols. The Wolf’s eye is the scatter bonus symbol if the game that will activate the free spins bonus round when 3 eyes land on the reels. During these spins, the Trailing Wilds feature will be active. The scatter symbol also gives scatter pays to lucky players. The logo of the game is wild that can substitute for other icons. The game also has the collect a wild icon that can turn the entire reel wild for four spins when players manage to collect 4 wilds in the compartments under the reel.